Angela Hunt does a great job of creating a multicultural character setting that is more historically accurate than most books these days. She also uses the various names of God to tell her story and I truly enjoyed that aspect. Mrs. Hunt wrote this book so well I cussed (not cursed) aloud when they captured Samson! I was calling folks names & getting angry as if I was right there in the story. While I wouldn't agree with the narrative taken on Delilah personally, Mrs. Hunt weaves a very believable story of a woman so blinded by vengeance she will ruin her own life to have it. I believe that Mrs. Hunt wove the story so well because honestly it seems the only way a woman really would break her own heart was for something she deemed more worthy than her own happiness. In Delilah's case that would be her betrayal of Samson. I easily identified with Samson's struggle to fulfill his Nazarite duties while warring with his flesh. When struggle with what God calls us to do opposess our flesh "nature" we make mistakes. God worked even Samson's mistakes for His good. This novel gives you a humanitarian view of the great downfall of Samson. 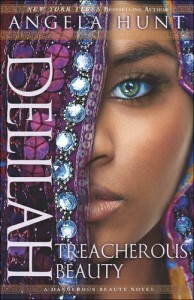 You should definitely get caught up in Samson & Delilah's tangled webs of lies and deceit!